My second day at the Toronto Fringe was a one-play affair (don’t judge, I had things to do). But here’s the FULL LIST of our festival reviews if one isn’t enough for you. I was nervous about this one. 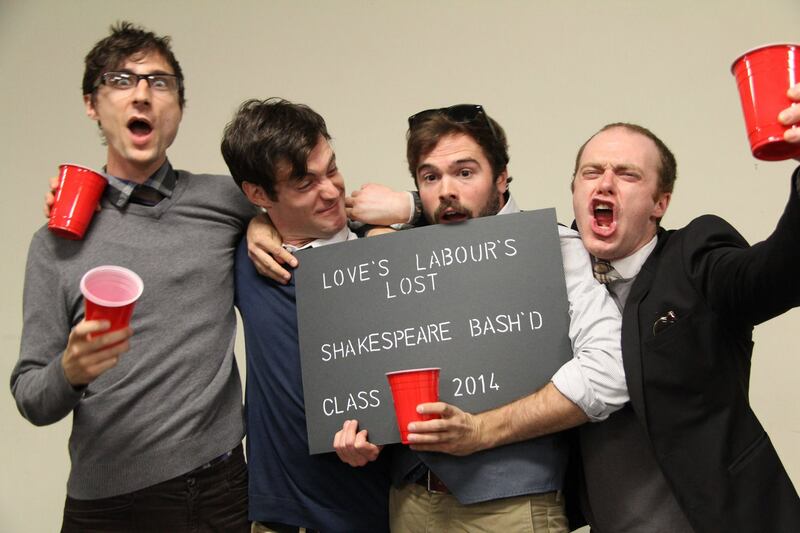 My love of Shakespeare Bash’d and their clear, thoughtful approach to the bard has gone far from undocumented and, with every cast list, they keep pushing my expectations higher (literally every crop of new faces has at least one My Theatre Award nominee, usually two). But their most recent productions have been of my #4 and #8 favourite Shakespeare texts; Love’s Labour’s Lost is #23 (of only 29 since 9 remain unread/unseen). It’s an odd play full of language that’s really difficult to deliver naturally (naturalism being one of my top priorities in assessing most performances) and, while I love the lovers’ A-plot, I tend to loathe the subplots (sorry, Don Adriano, but I hate you and always will, despite the valiant David Ross’ best efforts). This was also set to be Bash’d’s second production in a row without their ace leading man because he was too busy directing to act (Warning: every Bash’d review will include a complaint like the previous sentence until I succeed in bullying James Wallis back onto the stage. Take note, sir). I needn’t have worried. It took about 0.4 seconds from the time I reached the top of the stairs at the Victory for my nerves to disappear. Waiting for the show to start, the King of Navarre (perennial favourite Jesse Nerenberg at his most dashing) and his cohorts are playing beer pong. If you’re there early enough to watch the game before the text kicks in and the boys make a terrible plan to stay celibate so they can focus on their “studies”, you’ll likely absorb everything you need to know about these four gentlemen, from the jovial mockery that anchors their friendship to their personal foibles (Longaville’s shyness; Dumaine’s buffoonery/possible alcoholism) to their complicated power dynamic (the nameless King is the king but Berowne still vibes like the ringleader). The chemistry, casting choices, direction and individual performances work in perfect harmony here to establish the world, the tone and our romantic heroes/doofuses right out of the gate. When Hallie Seline (wonderfully grounded and endlessly charming as the Princess of France) leads in her parade of savvy but giggly girls and the two groups of friends pair conveniently off into four couples, the zany romantic hijinks begin (complete with a Russian dance routine so strange and jubilant it’s impossible not to enjoy). As advertised, Nerenberg and Seline are perfectly matched (and just so very swoony) as the most serious of the pairs (they do, after all, have some actual business to attend to) though I took great delight in seeing that just as much thought had been given to the compatibility of sidekicks Katherine and Dumaine as to the royals. In the hands of Joshua Browne– who brings just as much intensity to comedy as he does to drama– Dumaine is far more of a scene-stealer than usual, providing many of the play’s plentiful laugh-out-loud moments. The usually overlooked Katherine here isn’t just one of the Princess’ gal pals (like the far-less-interesting Maria) but rather an offbeat tomboy as delighted to receive fingerless leather gloves as a token from troublemaker Dumaine as Maria is to receive pretty pearls from Andrew Gaboury’s adorably nerdy and sincere Longaville. It’s always troubled me that Love’s Labour’s‘ four men meet four women and pair off so conveniently (in reality at least 3 of them would be fighting over the Princess) so I loved how distinctly Catherine Rainville played into being someone Dumaine would be attracted to when, say, the King might not be. A similar idea is built more into the text for Berowne and Rosaline- often thought of as prototypes for bickering wits Benedick and Beatrice– and the charming duo of Jeff Hanson’s suave Berowne and Suzette McCanny’s swaggering Rosaline carry that mantle beautifully. If the production were just eight adorable people being adorably in love and playing adorably silly Russian-themed pranks on each other while losing their oaths to find themselves, I would have declared it my favourite thing at the Fringe, even though it was only Day 2 and that’s ridiculous (and also Potosi was amazing). Alas, Love’s Labour’s Lost has subplots. Stupid subplots. Silly accents and dumb prop humour subplots. Carly Chamberlain manages to squeeze some good laughs out of Holofernes’ pretension and the smart casting of Christopher Fowler as Costard lends that character a Christopher Fowler-y dryness that really works well in certain moments, but I still spent almost every second of the subplot hoping someone (anyone) from the main plot would reappear. In all fairness, the four main couples are so funny and charming and sweet that I don’t know how anyone could want to watch anyone else. True Blood: “Karma” is a ….